Combined with the DDST construction, this gives CARUNO the solidity and vibration absorption properties high level archers desire. 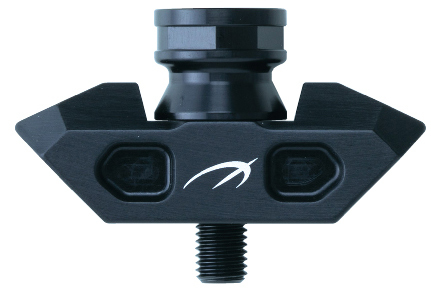 Long Rod and Side Rod employ individually optimized carbon blends, offering superior vibration absorption and stiffness, while reducing torsional rigidity for optimal shooting feeling. The V-Bar Extender shaft features high torsional rigidity and stiffness, firmly supporting V-Bar, Long Rod and Side Rods. CARUNO Stabilizer's Dual Diameter Spine Tuning (DDST) construction enabled us to dramatically reduce the mass weight of the stabilizer rod without sacrificing its strength, by varying the inner diameter of the rod at the base and weight end. Long Rod features a higher wall thickness at the stabilizer base, which requires the highest stability. The weight end of the shaft, which experiences a lower amount of stress upon the shot, features a reduced diameter, drastically reducing the weight of the rod. 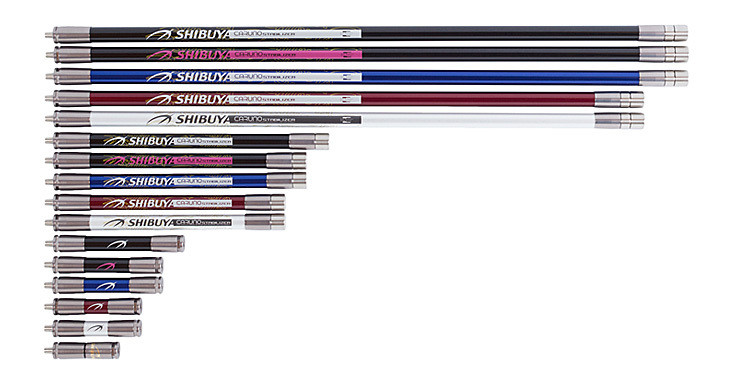 The CARUNO V-Bar Extenders feature SHIBUYA's popular Direct Link System. An Aluminum "connecting rod" is inserted inside the carbon pipe, creating an incredibly strong bond between the end bushings, and offering unbeatable stiffness. Just like Shibuya's world-famous sight systems, CARUNO Stabilizers are produced in Japan to meticulous quality standards. Soft fabric cover with Velcro closure. Available for long rod and side rods. Mass weight roughly half that of conventional V-bars enables the archer to attach more weights to the far ends of the stabilizers, making possible a setting that distributes weight away from the riser. Reducing the weight of the V-bar opens the door for unlimited choice of stabilization systems and finer balance adjustment than ever before! Lightness and functionality – realized in a beautiful multifaceted shape. All but the necessary material to offer optimal durability has been shaved off, resulting in a beautiful, geometrically complex shape. Caruno V-Bar's Attachment Bolt uses a brand-new alloy that offers even higher strength than the commonly used super-tough A7075. Precision CNC machining enabled us to realize this complex form, weighing only 1/3 of a conventional stainless steel V-bar bolt. Caruno V-Bar includes a spanner for tightening the V-Bar Bolt, enabling solid attachment without the slipping and turning involved with using a wrench. Very wide extenders and side rods may not be able to be attached simultaneously. Please contact your nearest Archery Pro Shop or SHIBUYA for more details.